If you’ve just started up a business, you might be asking yourself what is an invoice? Put simply, an invoice is a document that specifies what a client or customer must pay the seller for their goods or services. If you’re a tradie who has repaired a building or a cafe owner that has catered for an event, it’s likely that you will need to send an invoice. 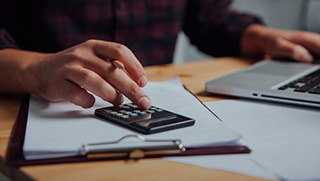 In the early stages of starting out your business, you’ll probably only have a few invoices to track and invoicing will seem fairly straightforward. Fast forward to when your business starts growing with new customers and projects, and invoicing can start to become manic. Ensuring that you have a strong understanding of all things invoicing is critical to make sure your business maintains a healthy cash flow to survive and grow. Why is it important to invoice? An invoice is a way to communicate to your customers the service or products your business has provided and what you’re owed in return. It will let the buyer know how much they have to pay, when the payment is due, and the ways in which they can pay. Invoicing is also extremely important for tax reasons and staying compliant with ATO. When you run your own business, you are required to keep copies of your invoices to report how much you earned, if you’re GST registered and how much tax you’ve collected. An organised invoicing process will help you keep track of sales and payments and can be used to follow up on overdue or missing payments. If you let invoices pile up and the process is confusing for your customers, it may result in payment delays which can severely affect your cash flow management. What to include on your invoice may vary from business to business. A tradie may want to list the hourly rate with a paragraph detailing the work and project deliverables, while a doctor may want to list procedure codes for insurance reasons. 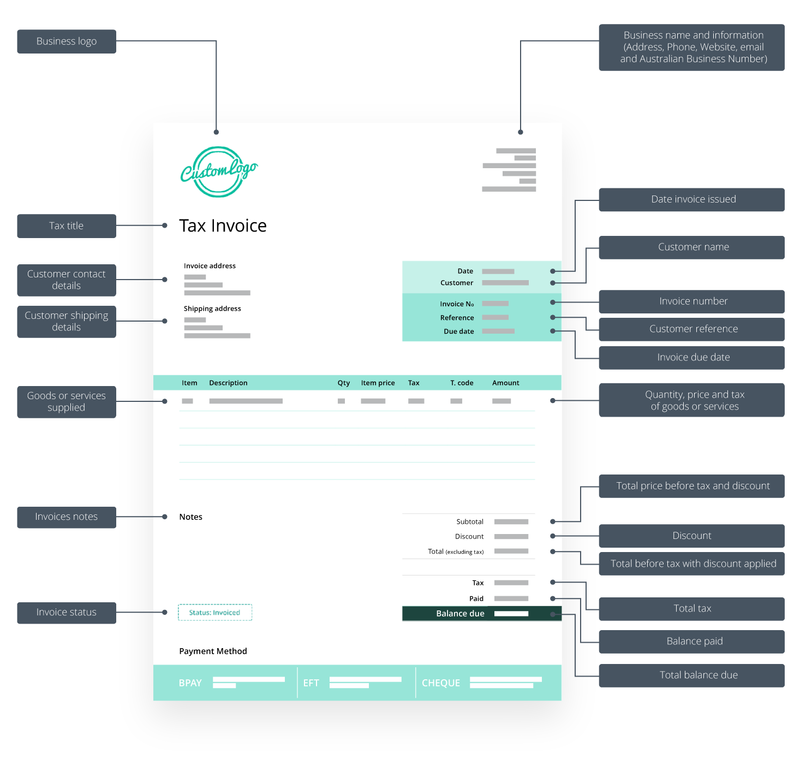 The good news is that once you’ve set up an invoice template you’ll be able to continue to use this each time you want to create an invoice as some of the details will stay the same. For the content that varies, you can create placeholders in your invoice template. The payment terms and methods of payment you offer may change occasionally. If they do change for a particular customer or job, you’ll need to remember to alter them. We have created an example invoice template below that explains how to write an invoice for your business. Logo: Your custom business logo. Tax title: Your invoice requires a title. If you are registered for GST, the title of the invoice should be ‘Tax Invoice’. If you are not registered, you can name the document ‘Invoice’. Date invoice issued: The date the invoice is issued. Invoice number: A unique invoice number which distinguishes each invoice from all others. Customer reference: If your customer has provided you with a purchase order number you will need to include this on the invoice. If you haven’t been given this information, you can list the name of your contact person at the business. Invoice due date: How many days (from the invoice date) the buyer has to pay the seller and payment due date. Business name and information of seller: Your business name, address and contact details. Freelancers and sole traders can use a personal name. Include the details of the person to contact if the customer has queries about the invoice. 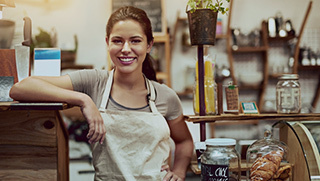 Tax or business number: Your Australian Business Number (ABN). If you don’t add one, your customer may withhold 47% of the invoice value. Customer contact details: The customer’s name and address to send the invoice to. If it’s an organisation, check their legal name as it could be different from the trading name you’re familiar with. Customer shipping address: The name and address to send the goods to. May be optional if it’s the same as the invoicing address. Item description: A brief description of each of the products or services you supplied. Quantity: The number of items you supplied or the number of hours you’re charging for. Item price: The price per item or per hour, or the fixed price you agreed upfront. Tax: The amount of tax that applies. T. code: Transaction code if applicable. Amount: The price for that item or service, obtained by multiplying the unit price by the quantity. Subtotal: The total amount before GST of all the goods and service listed. Make sure you apply any discounts you’ve offered and include any shipping charges. Discount or late fees: The amount of any on-time discounts or late fees. How the buyer can pay the invoice: The methods of payment you offer, eg, internet banking, credit card, BPAY, PayPal, cash, cheque. Include your bank account number or a link so customers can pay online. Ensuring you have a professional design for your invoices is very important. Every invoice provides an opportunity to market your business and can affect the perception of your brand, customer satisfaction, and even how quickly you receive payment. Create an email address specifically for dealing with invoicing and accounting. For example, set up accounts@yourcompany.com and send all your invoices from that email. This will create a stronger impact on the buyer when they are asked to be pay. Make sure you send your invoices to the right people, such as the bookkeeper or business’s CFO. Set crystal-clear terms on the invoice so that you get paid on time, and include late fees associated with late payments on the invoice. The easiest way to manage and keep track of your invoices is by using invoicing accounting software, allowing you to conveniently send and track professional invoices. An online invoice allows your customers to pay you fast with a simple click of a button, and there is no risk of the invoice ‘getting lost in the mail’. Here at Reckon, we are proud to include online invoicing among the capabilities of our business accounting software. Reckon One offers invoicing and billing with our invoicing module. Be prepared that there will be times when your customers may forget to pay an invoice. Online invoicing software allows you to easily see what’s been paid and what hasn’t, and you can go in and hit the re-send button to anyone who may need a gentle reminder. It is important to follow up, as not getting paid on time can have an impact on your cash flow management. Running a streamlined invoicing process will ensure that you send invoices and receive payments in a timely, organised manner. This process is vital to help your business maintain a healthy cash flow and to grow. Learn more about invoicing and how accounting software can work for you with Reckon One. Reckon One is online accounting software perfect for small businesses.